In the first week of July 2014, Hamas’ rocket attacks against Israel intensified. In response, the Israel Air Force struck targets in the Gaza Strip. The Israeli government emphasized that if Hamas stopped firing rockets, Israel would have no reason to act. Hamas continued to escalate its attacks. On July 8, Israel declared the start of Operation Protective Edge; its goal was to restore quiet to southern Israel and to make Hamas pay a price for its ongoing rocket barrages. The IDF operation remained an air campaign until July 17, when a Hamas tunnel infiltration led to a limited IDF ground incursion in order to locate and destroy the underground passages that opened inside Israel. IDF ground forces completed that mission and withdrew from Gaza on August 5, but Hamas’ rocket attacks continued; so, too, did the IDF air campaign. 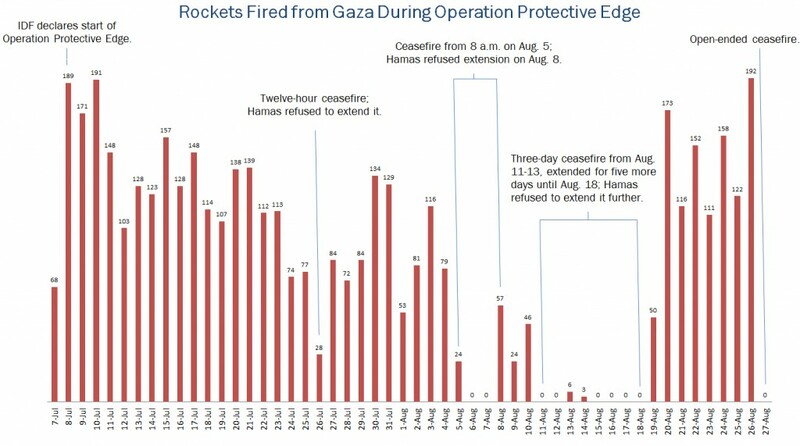 On August 26, Hamas – which had rejected or violated 11 ceasefires during the war – accepted an open-ended ceasefire, having achieved none of its demands for an airport, a seaport, open borders, prisoner releases and more. The following timeline is a brief summary of the major events in the summer war. In response to a dramatic increase in Hamas rocket and mortar attacks, the IDF declared the start of Operation Protective Edge. Hamas commandos infiltrated Israel by sea at Zikim. Rockets hit Jerusalem and Hadera (100 km. from Gaza) and were intercepted over Tel Aviv and surrounding areas. Leaked IDF video of the Hamas frogmen assault on the Mediterranean coast inside Israel, just north of the Gaza Strip border, on July 8, 2014. Rockets hit Zichron Yaakov, 120 km. from Gaza. Rockets fired from Gaza struck Bethlehem and a Palestinian house in Hebron. 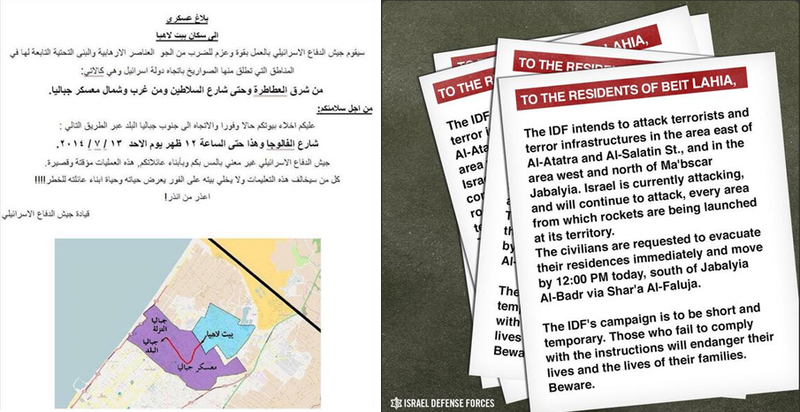 The IDF dropped warning leaflets over the Gaza Strip with specific evacuation instructions. Hamas urged Palestinians to ignore the IDF’s warnings. Hamas launched a UAV into Israel. The IDF intercepted it with a Patriot missile above Ashdod. At 9:00 a.m., Israel accepted an Egyptian-mediated ceasefire and halted all strikes in Gaza. Over the next six hours, Hamas fired 50 rockets at Israel. An Israeli civilian was killed by mortar fire at the Erez border crossing. At 3:00 p.m., the IDF resumed its operations in Gaza. The IDF dropped warning leaflets over Gaza with specific evacuation instructions. In the morning, 13 Palestinians infiltrated Israel through a tunnel dug from Gaza. The tunnel began in the southern Gaza Strip and exited near Kibbutz Sufa. The terrorists were heavily armed with RPGs and assault rifles and were prepared to carry out a massacre. The IDF foiled their attack, saving countless Israeli lives. After the tunnel infiltration, the IDF announced that it agreed to a UN request for a humanitarian window in Gaza and would hold its fire for five hours. Three mortars fired from Gaza hit Israel in that time. After the five-hour window expired, Hamas fired over 100 rockets at Israel. In the evening, the IDF intercepted a UAV above Ashkelon with a Patriot missile. At night, the IDF began a large-scale ground operation in Gaza. 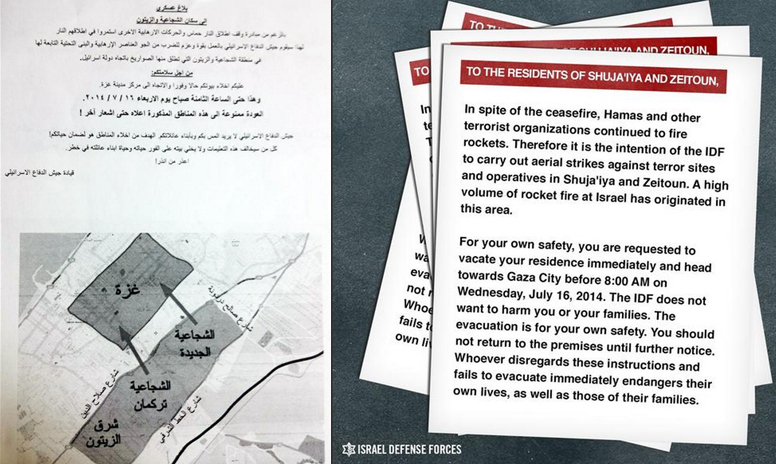 Before it began, the IDF dropped leaflets in 14 areas of Gaza, warning civilians to evacuate well-defined areas and providing clear instructions about where to move for their safety. “Following ten days of Hamas attacks against Israel by land, air, and sea – and after repeated rejections of offers to de-escalate the situation – the Israel Defense Forces has started a new phase of Operation Protective Edge. A large IDF force of infantry, tanks, artillery, combat engineers, and field intelligence is entering the Gaza Strip. The force is supported by the Israel Air Force, Navy, and other Israeli security agencies. Their mission is to target Hamas’ tunnels that cross under the Israel-Gaza border and enable terrorists to infiltrate Israel and carry out attacks. Hamas terrorists infiltrated Israel in three separate incidents. In one attack, a Hamas squad emerged from a tunnel wearing IDF uniforms and fired an RPG at an IDF jeep, killing two IDF officers. Overnight, 13 Israeli soldiers were killed in the Gaza City neighborhood of Shujaiya – seven of them in a troop carrier that took a direct hit from an anti-tank missile, and six others in subsequent fighting. Hamas captured the body of IDF soldier Sgt. Oron Shaul. Israel approved a two-hour humanitarian window in the area of Shujaiya, following a Red Cross request. Forty minutes after the ceasefire began, Hamas violated it. Nevertheless, Israel extended the ceasefire for two more hours. Two Hamas squads infiltrated Israel from northern Gaza via a tunnel. They were identified by IDF lookouts and targeted by air and ground forces. A rocket struck a house in Yehud, near Ben-Gurion Airport. Following the rocket strike in Yehud on July 22, the U.S. Federal Aviation Administration (FAA) banned flights to Israel. The UN Human Rights Council condemned Israel for war crimes, including the targeting of civilians, and called for an international investigation of Israel and accountability for crimes committed. Hamas was not mentioned in the resolution. The FAA lifted the ban on flights to Israel. Israel agreed to the UN’s request for a humanitarian ceasefire from 8:00 a.m. to 8:00 p.m. Israel said it would extend the ceasefire until midnight, but a few minutes after 8:00 p.m., Hamas fired rockets. Hamas called for a 24-hour pause for the Muslim holiday of Eid al-Fitr, but violated its own ceasefire initiative by firing rockets at Israel. A Hamas squad emerged undetected from a tunnel near an IDF base at Nahal Oz, stormed the fortified area, and killed five IDF soldiers. Hamas later published video of the attack. Separately, four IDF soldiers were killed in a mortar attack near the Gaza border. Rockets fired by Palestinian terrorists in Gaza hit Shifa Hospital and Shati refugee camp. A Hamas video published on YouTube shows its fighters infiltrating Israel from Gaza via a tunnel and storming an IDF post at Nahal Oz on July 28, 2014. Israel announced a humanitarian ceasefire between 3:00 p.m. and 7:00 p.m. A few minutes after 3:00 p.m., Hamas fired rockets at Ashdod, Ashkelon, and other populated areas. Five IDF soldiers were killed when a mortar shell fired from Gaza exploded in a staging area near the border. U.S. Secretary of State John Kerry announced that “Israel and the Palestinian factions have agreed that they are now prepared to implement a 72-hour unconditional humanitarian ceasefire” starting at 8:00 a.m. Kerry emphasized that “Israel will be able to continue its defensive operations for those tunnels that are behind its lines.” At 9:30 a.m., Hamas terrorists, including a suicide bomber, ambushed IDF forces in Gaza, killing two soldiers and capturing the body of Lt. Hadar Goldin, who was later declared dead. Israel authorized a seven-hour humanitarian window in Gaza, from 10:00 a.m. to 5:00 p.m. Hamas continued firing rockets throughout the Israeli lull. The IDF withdrew its ground forces from Gaza and announced the success of its mission to dismantle Hamas’ network of infiltration tunnels. Israel accepted an Egyptian proposal for a 72-hour ceasefire from 8:00 a.m. Before the ceasefire went into effect, a rocket fired from Gaza hit a Palestinian home in Beit Sahour, near Bethlehem. Israel notified Egypt that it accepted a 72-hour extension to the ceasefire, but Hamas refused. At around 4:30 a.m., Hamas shot two rockets at Israel, violating the ceasefire that was set to expire at 8:00 a.m. When that time passed, Hamas dramatically increased its rocket attacks, injuring a number of Israelis. The IDF held its fire for hours, but eventually responded. Hamas rockets struck the Kerem Shalom border crossing and forced it to close temporarily, delaying the passage of vital humanitarian aid for Palestinian civilians in Gaza. At 12:01 a.m., Israeli and Palestinian negotiators accepted Egypt’s proposal for a new 72-hour ceasefire. About two hours before midnight, Palestinian terrorists fired a rocket toward Ashkelon – violating the ceasefire agreement – and after midnight, a rocket barrage hit southern Israel. The IDF responded by hitting at least four targets in Gaza. Hamas denied that it was responsible for the attacks. Israel and Hamas agreed to extend the ceasefire for five more days, until 11:59 p.m. on August 18. Israel announced it agreed to extend the temporary truce in Gaza for 24 more hours while – at Egypt’s request – it continued to negotiate a permanent agreement with the Palestinian delegation in Cairo. Hamas broke the ceasefire by shooting rockets at Beersheba and Netivot. In response, the IDF struck targets in Gaza. Hamas then fired rockets at Ashkelon, Ashdod, Tel Aviv, and Jerusalem. The IDF Home Front Command ordered the opening of public bomb shelters up to 80 km. from Gaza. Late at night, Israeli warplanes dropped at least five bombs on a house in Gaza City in an effort to target Mohammed Deif, the commander-in-chief of Hamas’ military. It was not clear whether Deif survived the attack. Overnight, the IDF targeted senior Hamas military commanders in Rafah: Mohammed Abu Shamlah, Raed Attar, and Muhamad Barhoum. Attar oversaw Hamas forces in Rafah and planned the kidnapping of Gilad Shalit in 2006. Abu Shamlah directed Hamas’ forces in southern Gaza and planned dozens of terror attacks that killed Israeli civilians and soldiers; he also was involved in the Shalit abduction. Barhoun smuggled weapons to Hamas in Gaza and raised funds in Libya and Syria. A Grad rocket fired from Gaza hit a synagogue in Ashdod, injuring three civilians. About two hours later, a four-year-old Israeli boy, Daniel Tragerman, was killed from shrapnel when a mortar fired from Gaza hit his house in Kibbutz Nahal Oz. The mortar was fired from near a Gaza school used as a shelter for Palestinian refugees. In Gaza, Hamas executed 18 Palestinians for suspected collaboration with Israel. Israel leveled the 12-story Zafer Tower, where the IDF said Hamas used multiple floors for operational activities. Local residents were warned to evacuate, and there were no fatalities. An IDF airstrike on the Zafer Tower in Gaza City on August 23, 2014. All residents were evacuated before the strike. An IDF pinpoint missile strike targeted Muhammad al-Ghoul, a senior Hamas member who managed the terrorist group’s financial transactions in Gaza. The strike ripped open his vehicle, revealing bags of American dollars. Currency was scattered on the street. In Israel, three Israeli Arab taxi drivers were wounded by mortar fire at the Erez crossing. The drivers were transporting Palestinians from Gaza for medical care in Israel. Israeli airstrikes leveled the 15-floor Basha Tower and badly damaged the 13-story Italian Complex used by Hamas. The towers were evacuated before the attacks. In the evening, two Israelis died in a mortar attack on Kibbutz Nirim. Fifty-five-year-old Ze’ev Etzion, the security chief for the kibbutz, was killed as he worked to fix electricity lines damaged in an earlier mortar attack. Shahar Melamed, a 43-year-old father of three, died on his way to the hospital. Shortly after the mortar attack, Hamas accepted an open-ended, Egyptian-brokered ceasefire agreement and declared victory, even though the deal was nearly identical to the one it rejected in the first week of the war. Palestinian Authority President Mahmoud Abbas blamed Hamas for needlessly prolonging the war in the Gaza Strip and for the resulting loss of lives and property damage. Had Hamas accepted the original ceasefire, Palestinian wartime fatalities would have numbered less than 200, as opposed to the more than 2,000 who died by the time Hamas stopped its attacks. Daniel Rubenstein is an editor and researcher at the Jerusalem Center for Public Affairs. Follow his personal Twitter account @paulrubens.